Are you tired of your man's wandering, roving eyes? Doesn't it infuriate you even after all this time together? Even when he won't act on what his eyes drool over? So you think... maybe? What when he gets online? Oh! the doubts, how they eat you up and more! A boyfriend / husband staring at other women can trip the insecurity switch of his woman who already has to compare herself with the beauty standards of the world all around her, especially that of her family, friends and peers. The last thing a woman wants to do is feel she's not even measuring up to the beauty standards of HER world of - her partner/ husband - her Man. Yes believe it or not, that's how much a Man means - literally the universe - to many women. You know what it's like. You go out on a date with your man and five minutes after getting to the restaurant his eyes start to wander, not just at the pretty waitress, but at anything that wears a skirt or less, nearby and even further afield if hotsy or babesy. If he isn't staring at the blonde with the low-cut top (DD cups?) at the next table over he's staring at the pretty redhead in hot tights that happens to showcase her super buns to perfection (big sigh!) as she sashays her way out the door (darn her antigravity buns!). You start to wonder if yours is drooping, just a wee bit, perhaps? You suffer silently and try to let it go just to avoid a horrid scene. Because that's the way you were brought up/ brainwashed: lady-like, to grin and bear it, and not to make a "fuss" especially in public. So you keep up the charade and act like the "good" wife/ girlfriend. But inside you die a little bit each time. Worse, you know those old feelings of low self-worth and resentment? They re-surface. You're not sure if you're "good enough" for him. And then there's the anger, it builds, smoking, smouldering, seething like Vesuvius. And the hurt. It pains you that he doesn't seem to look at you that way. Not anymore. WHY NOT? You're not ugly. He couldn't take his eyes off you initially...it was so flattering. He took you so high you flew. So why did he stop when you know he knows you still look great? What's a girl to do? What can you do? You feel helpless. Don't fret - all is not lost. You can fight back you know...take back your Power. Fight for his exclusive gaze (and love, that's what you really want). No, not violently but savvily, like the Tigress you really R-R-R... but didn't yet know till now, when it comes to claiming your MAN. Here's how to do it - how to INSPIRE Your Man to have eyes for YOU ONLY and banish your misery once and for all. You can't force him but you can INSPIRE HIM. Find out how to do this EFFECTIVELY. 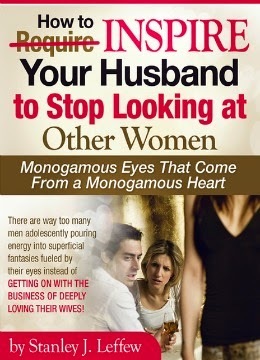 Arm yourself with Expert Help if you wish to reclaim his Monogamous Eyes quickly and successfully, once and for all! Romantic Tip: There's no lack of socialising at work and play at this time of the year, hence this resource will come in useful if you're in this situation. 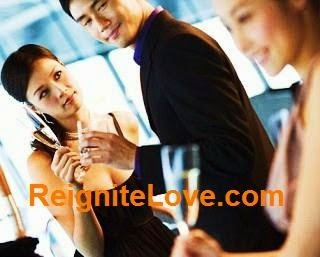 Make this year one of the best Christmases you've ever had with your Man! Take the opportunity to stand under many mistletoes so you can take him tripping down memory lane...to that first, wonderful date with you...all over again!